Hi Lovelies! I have finally decided to plan a little tiny giveaway for you all to say Thank You for the support for my blog over the past three months. It has been absolutely amazing and I cannot thank you enough. Recently, I went to buy a few treats from Lancome and was given this gorgeous Red Carpet Gift Set for the Baftas Awards this month. I thought that it would be the perfect little prize to win, so I am giving it away to one of you lovely lot. You get the glittery Lancome clutch bag and four samples. The Lancome Juicy Tubes in a cute deep pink, the Lancome Hydra Zen Neurocalm Soothing Anti-Stress Moisturising Cream, the Lancome Genifique Youth Activator and the Lancome Hypnose Drama Mascara. 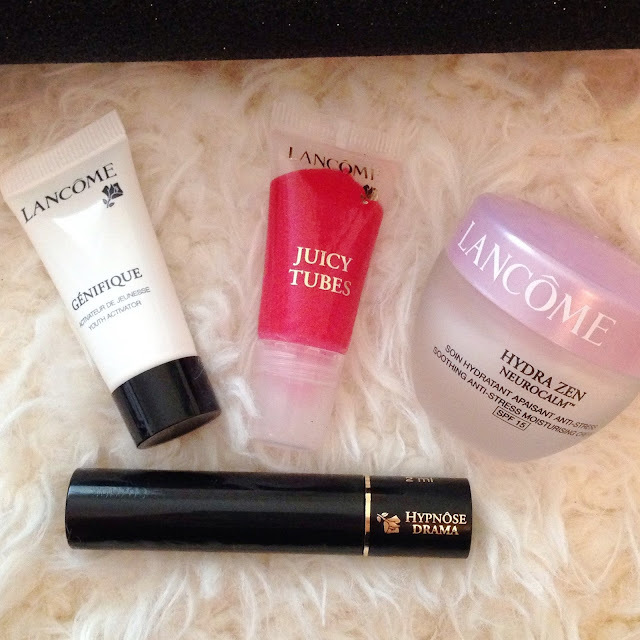 All of these are perfect for trying out some new Lancome products, which are always such a luxury. The winner will be chosen at random by the Rafflecopter and all entries will be checked, so please dont waste your time entering with fake accounts. Thanks lovelies :) I wish you all the best of luck entering. 1. You have to follow on GFC or Bloglovin to enter.